Man finds Scottish independence shaped KFC fried chicken! News of the referendum has reached the deep fat fryers! There’s been some strange stories in the run up to the referendum on Scottish independence but none come any stranger than this! 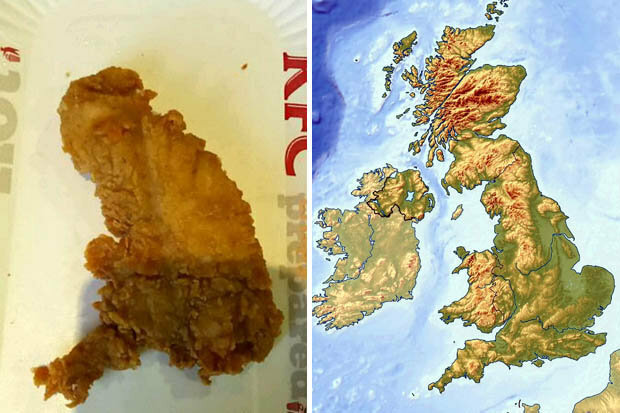 55-year-old fast food fan Terry O’Neil has discovered a KFC fillet feast piece that looks just like the UK – minus Scotland! “I picked this one piece out and I thought it looked like the map of Britain, but then I realised Scotland was missing,” Terry said. To be honest with you Terry, it just looks like a tasty bit of fried chicken to us!